For the next three sermons I want to spend time to look at the topic of the New Birth, or what does it mean to be Born Again? 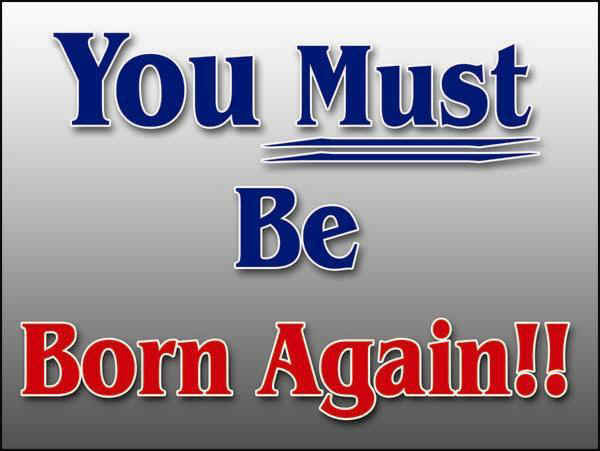 There is a lot of confusion on the subject to the point that one Christian said to me a few years ago, that his church does not believe in this born again junk. For a long time I have been used to been called a born again freak. For the next three sermons, which we will look at over maybe 5 - 6 weeks, we will study John 3 and see what we can learn in this regard. So, let’s jump right into it, and I want to encourage you to try and not miss a Sunday, so that you can stay with the order of my preaching. Before we can study John 3, I need to remind you that the Bible was not written in chapters and verses, and that the message of John 3 cannot be understood without understanding John 2. In John 2 we see Jesus performing His first miracle which is turning water into wine. And then we have the cleansing of the temple, and based on John 2 we know that Jesus performed more miracles over the Passover. So, what is the connection then between John 2&3? We must remember that John is writing in a purposeful manner. He has an overall purpose which is why He does not record everything that Jesus did, but what he records he records in an organised fashion. Now, if you want to know his overall purpose you simply need to go way forward to John 20:30-31 (ESV) which says: “30 Now Jesus did many other signs in the presence of the disciples, which are not written in this book; 31 but these are written so that you may believe that Jesus is the Christ, the Son of God, and that by believing you may have life in his name.” The book he is referring to is the gospel of John. John 3 is most definitely written so that you may believe and have life in His name. So if there is a connection, what is it? One connection is that Nicodemus acknowledges the signs that Jesus performed in John 2. Listen to what Nicodemus said to the Lord Jesus; ““Rabbi, we know that you are a teacher come from God, for no one can do these signs that you do unless God is with him.”” Nicodemus saw the signs and realises that there is something undeniably different about Christ and that He must be from God. So, here in Nicodemus as recorded in John 3 you have the ‘representative man’ of those of whom Christ was talking about in John 2. In John 2, they were looking for signs, but Jesus showed them that they do not have the spiritual capacity to interpret signs, therefore the only sign He will give them is the sign of His resurrection as represented in the destroying of the temple which Jesus said He would build up again in three days. So in John 2, Jesus had demonstrated the failure of man if left to himself in his natural state to deal with spiritual things. And now we have a concrete example of the inability of man in his natural state to interpret spiritual things and that representative man, the concrete example is Nicodemus. So in this chapter we see Jesus again demonstrating that he knows what is in a man’s heart. Nicodemus says some things to Jesus and Jesus passes right by what he says. He doesn’t even deal with what Nicodemus says. He deals with something else because Jesus knows what is in a man’s heart. There are three things I want us to see from these three verses. We will firstly look at who this man is who came to Jesus. Then next week we will look at the question this man asked and we will look at the central issue that is at stake here over two weeks. 1. The man who came to Jesus. What do we learn here about this man Nicodemus? 1.1 He was a religious man. He was not just a religious man; He was a very religious man. He was a Pharisee. Now when you and I hear the word Pharisee we immediately have negative thoughts. The reason we have negative thoughts is because we have the gospels. We know that their religion was external, it was legalistic and not something that God approved of. But if you had lived back in their day you would not have had those thoughts immediately. In fact they were the best men in their country. There were not many of them. According to Josephus the Jewish historian there were about 6000 of them at the time of Herod the Great. They were a select brotherhood. They were serious about the law of God. They saw the Old Testament as the revealed Word of God. They believed in the inspiration of the Scriptures. They believed that the first five books of the Old Testament represented an inspired code of ethics that were to be believed and practiced. They were very meticulous in their obedience to Scripture. And so in their mind it was the scribes’ job to work out the exact meaning of the law and it was the work of the Pharisee to keep it. They were also distinguished from the Sadducees in an interesting way. The Sadducees said; ‘just the Scriptures, just the Old Testament.’ The Pharisees on the other hand believed also in the oral traditions and so they took the interpretations of the law given by past Rabbis and Scribes and they elevated those interpretations and applications to a place of equal authority to the Scriptures. So Nicodemus would have held fast to the Scriptures but also to the traditions. You couldn’t become a Pharisee unless you swore allegiance to the various laws and their application of the law and even then you were on probation for up to a year so that they could observe your obedience. 1.2 He was a gifted man. Notice what verse 1 also tells us about this man; “Nicodemus, a ruler of the Jews.” This means that he was a member of the Sanhedrin in Jerusalem. The Sanhedrin was the supreme court of their day. It ruled on civil matters that Rome had entrusted to it and it ruled on religions matters. It was made up of 71 members with the high Priest serving as its head. It had former chief priests serving on it, as well as Sadducees who served on it as well as scribes who were Pharisees and experts in the law. Even though the Pharisees did not have the most votes in this court, their views were most respected as it was popular with the people. So, Nicodemus was a Pharisee who served as a ruler on this Supreme Court for his people. Also you will notice that when Jesus addresses Nicodemus later on down in verse 10, He says: 10 “Are you the teacher of Israel and yet you do not understand these things?” It does not just say, are you a teacher in Israel? It literally says ‘you ‘the’ teacher in Israel’. Nicodemus had a reputation as teacher in Israel and that reputation was that he was the pre-eminent teacher. So he was gifted in knowledge, ability, respect and influence. So he is a very religious man but also a very gifted man. 1.3 He seems to be an honest man. As far human honesty and integrity goes, it seems that he was that kind of man. He comes to Jesus in a very open way, doesn’t he? He is very transparent John 3:2 (ESV) 2 This man came to Jesus by night and said to him, “Rabbi, we know that you are a teacher come from God, for no one can do these signs that you do unless God is with him.” He makes it very plain that he has been thinking about Jesus. He had an honest way of evaluating and considering the signs. This is not a man with all his status and wisdom who took one look at Jesus and just dismissed Him. He doesn’t reflect the attitude of many other Pharisees that he will not even give Jesus any thought. He seems to be fair minded and even handed in that way. Also notice that in this statement in verse 2 he is very respectful toward his own group that he belongs to. He says in verse 2: ‘Rabbi, we know’. Now I don’t know if Nicodemus here pretends to be a spokesman for the Pharisees or a group of them or if he is just expressing his own thoughts in a plural fashion. It’s like you individually coming to me on a Sunday morning and saying, ‘Pastor we really appreciate the length of your sermon’, you will clearly be speaking for yourself. Whatever, the case, he is not distancing himself from the group that he belongs to. Now we know that at least for the future Nicodemus cannot be speaking for the whole group because there were many of them that did not believe that the signs represented God’s presence, God’s working or God’s seal of approval. In fact many of the group that Nicodemus belonged to attributed the works of Jesus to works of Satan. So to say that ‘we know, you are a teacher who has come from God’ cannot possibly refer to the whole group at least as we move forward into the future of the life and ministry of Jesus. But I find that even when Nicodemus disagrees with the Pharisees he always does it very respectfully. A good example of this is in John 7 where we get a sense of what kind of man this was. John 7:45-52 (ESV) “45 The officers then came to the chief priests and Pharisees, who said to them, “Why did you not bring him?” 46 The officers answered, “No one ever spoke like this man!” 47 The Pharisees answered them, “Have you also been deceived? 48 Have any of the authorities or the Pharisees believed in him? 49 But this crowd that does not know the law is accursed.” (Do they see Him as a teacher who has come from God? They rather base their understanding on the law. It is like these modern day theologians who reject the deity of Christ on the basis of science.) “50 Nicodemus, who had gone to Jesus earlier and who was one of their own number, asked, 51 “Does our law condemn anyone without first hearing him to find out what he is doing?” (See what Nicodemus does. They claim the people are ignorant based on the law. Nicodemus reminds them that the law tells them to give a man like this a full hearing. So here you see that even amongst his own kind he is willing to stand up for justice.) “52 They replied, “Are you from Galilee too? Search and see that no prophet arises from Galilee.” So he is not disrespectful toward his group. He is also not disrespectful towards our Lord. After Nicodemus’s statements in John 3:2, Jesus replies in a total different way than what Nicodemus would expect by saying in verse 3: “3 Jesus answered him, “Truly, truly, I say to you, unless one is born again he cannot see the kingdom of God.” Look at Nicodemus’ response in verse 4: 4 Nicodemus said to him, “How can a man be born when he is old? Can he enter a second time into his mother’s womb and be born?” Jesus goes on and answers him some more, but then look at verse 9 where Nicodemus responds again: “9 Nicodemus said to him, “How can these things be?” And this is the last statement we have from Nicodemus. This is quite the opposite of the other Pharisees words and thoughts that we see in other sections. There is nothing in this text that indicates that Nicodemus displays any antagonism towards Jesus. In fact the way that He begins by saying ‘Rabbi’, is a respectful honorary address. Here is this man, so gifted with all his credentials, meeting with the teacher of God’s law, who at least from their perspective has none of those credentials. His only credentials are the works that He does, and yet he addresses Jesus as ‘my teacher, Rabbi’. So He is a religious man, He is a gifted man and he seems to be an honest man. 1.4 He has beliefs about Jesus. He is very forthright about the conclusions he has come to. Look again at John 3:2 (ESV) “2 This man came to Jesus by night and said to him, “Rabbi, we know that you are a teacher come from God, for no one can do these signs that you do unless God is with him.” In that statement he says that he believes Jesus to be a teacher. Secondly he believes Jesus to be a worker of genuine signs. He also states that Jesus had been sent by God. He also believes that Jesus is not only sent from God, but that God is with Him. He definitely does not believe that God is opposed to Jesus. So he comes to Jesus very open and very transparent about the conclusions that he has come to. We have people today who are willing to say; ‘You are a teacher’, “You are a sign worker’, ‘you are a good prophet’ or a ‘good man’, but are they willing to say “You are the Messiah, you are the promised one, you are the Son of God”. 1.5 He is facing a dilemma. This is a man who is in conflict. This is a man who is facing a dilemma. On the one hand there is something about Jesus that has drawn this man out. His conscience says to Him that there is something unique about this man. Nicodemus might even have had hopes that Jesus was the Messiah. We don’t know that. Even if he had those thoughts, most definitely at this stage he has not connected the Messiah with divinity. He is not yet thinking that the Messiah is God. There is a desire or something that he is hungry for that Jesus might represent, maybe He could be the Messiah? In fact Jesus is about to deal with him in such a way that He makes plain that He is much more than what Nicodemus has previously thought. He is not just a teacher. He is going to deal with Nicodemus with such authority, such accuracy with such insight that he basically reduces Nicodemus to nothing. “Although nothing in this passage suggests Nicodemus was converted that evening (and verse 11 strongly implies that he was not), he never forgot his discussion with Jesus. Later, he boldly defended Him before the Sanhedrin (7:50-51), and helped Joseph of Arimathea prepare His body for burial (19:38-39) – actions that indicate the presence of genuine saving faith in his life. Sometime after the memorable evening he spent with Jesus but before the crucifixion, Nicodemus came to understand sovereign grace and experienced the reality of new birth”. I think at this point of the burial it is fair to say that Nicodemus either now was a follower of Jesus or simply motivated by the same good heart that he approaches Jesus with in John 3. But if he was a follower of Jesus at this time then he is one in the same way as Joseph of Arimathea, and that is in secret. Why? Because he was afraid of the Jews. I believe that is the same reason why he came to Jesus by night. You go further in the gospels and you see the attitude of the Pharisees and the attitude of the Chief Priests towards Jesus, when you hear them saying things like ‘are you also deceived?’ and ‘have you also become His disciple’?, you understand that the atmosphere was such that it would be very difficult to say; ‘I believe’ or ‘I might believe’ or ‘I have some genuine interest in this man.’ So I believe that Nicodemus came to Jesus at night because He was afraid of the others. Sometimes it is the men who are the most polished, who are the most polite, who are the most politically gifted and astute who are also the most afraid to acknowledge Jesus before man. They will often respect Him from a distance. It is the fear of man that keeps them in the safe zone and they don’t step out and they don’t stand out for what they believe because it can be too costly, ‘they are not willing to step out of the closet, this time a spiritual one’, because in their mind the cost is too high. So we have a religious man, a gifted man, who seems to be an honest man, who will acknowledge certain things about Jesus but not all that he should and he is a man who seems to be in conflict. But there is one more important thing we need to say about this man. 1.6 He is a natural man. That is, despite His religion, despite His accomplishments and advancements in religion, despite his honesty and politeness, despite his sincere seeking in conflict Nicodemus was a lost man, he was a natural man, he was an unbelieving man. When you look at Nicodemus you would think that his problem was in the realm of understanding. He asks lots of good questions. In fact later on in this conversation Jesus makes it clear that His problem is not in the realm of understanding but in the realm of faith. It is in the realm of belief. Look at John 3:12 (NIV) “12 I have spoken to you of earthly things and you do not believe; how then will you believe if I speak of heavenly things?” What Christ is saying to Nicodemus is that his real conflict is ‘belief’. You see, this is where we started today. Nicodemus was a representative man, and Christ knew his heart. Here was a man in need of regeneration, here was a man in need of the new birth and what Jesus makes clear here is that he is not just a man in need of new birth, but he is a man no different from any other man who needs the new birth. Jesus talks to him in such a way that it makes plain that Nicodemus is standing in the same place that the whole human race stands in. He doesn’t show him any special favour; he doesn’t pay him any special complements. Nicodemus you have the same need that every man has. What does Jesus say to him in verse 3? John 3:3 (ESV) “3 Jesus answered him, “Truly, truly, I say to you, unless one is born again he cannot see the kingdom of God.” Not just Nicodemus, but no one can see the kingdom of God unless they are born again. In fact if Jesus is to help Nicodemus, Nicodemus cannot see himself as anything special. If Jesus is going to help Nicodemus, he is going to have to see that his religion means nothing, that his accomplishments mean nothing, that his personal integrity and reputation means nothing and that his knowledge of the law means nothing. All of that is a consequence of natural birth. He is going to have to start all over. He must be born again. By the way. Notice verse 4 where Nicodemus says: John 3:4 (ESV) “4 Nicodemus said to him, “How can a man be born when he is old? Can he enter a second time into his mother’s womb and be born?” There is some debate whether he is speaking literally here or figuratively. Nicodemus may have picked upon the teaching style of Jesus and what Nicodemus may be saying is this. ‘Are you telling me that all that I’ve done means nothing?’ Are you telling me that now that I am an old man I will have to start all over? Now whether that is what Nicodemus meant or not, that is the truth. No matter how advanced you are in religion, no matter how much teaching you had, no matter how gifted you are, no matter what your reputation or thoughts about your own personal integrity. Every man born into this world must be born again to see the Kingdom of God. And we all start at the same place. It is called ‘repentance’. It is called, bowing before the Lord and admitting our sinfulness and knowing that there is no hope for us except the sacrifice of the Lord Jesus. If not for the blood of Jesus there is no forgiveness for my sins. If not for the blood of Jesus there is no reconciliation with a living, Holy God. I have to start all over, because my only hope is Christ. This man with all his accomplishments is a lost man. He needed a new birth. That ends an important look at the man asking the question. Next week, we will look in detail of his question he never asked and Christ’s answer.